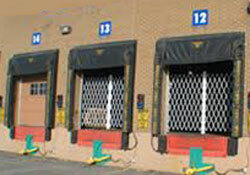 Tampa Bay Door Gates are perfect for securing high-traffic hallways or entryways in any type of business or industry. All gates are riveted with aircraft grade aluminum rivets. Gates will hold up to more stress, they won’t rust, will not crack and webbing will not separate — ever. All door gates are hinged and can be mounted on the right or left. 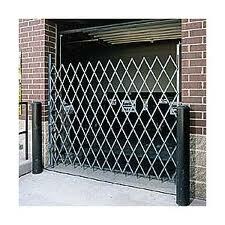 Gates collapse and pivot completely out of the way, providing safe door openings, 100% clear of obstructions. TampaBay’s folding security door gates can be installed in any doorway up to 48” wide, inside or outside the jamb. All are gates are designed to be easy to install in less than 30 minutes! If needed we can do the installation for you within 50 mile radius of Tampa BayFlorida. Door gates pivot on hinges, so they open in or out, just like a door, but also provide the enhanced air circulation and visibility of a standard steel folding gate. Folding door gates offer better circulation and added light that helps save money on energy costs. Increased security reduces theft and loss prevention costs. Healthier work environment, safer schools and a secure warehouse or business. 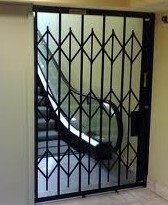 No matter what your situation is, we have a solution and will custom build you a door gate to your specifications. Call us for a free quote.